Anglicans opposed to the ordination of women bishops have been refused concessions they say would secure their place in the Church of England. 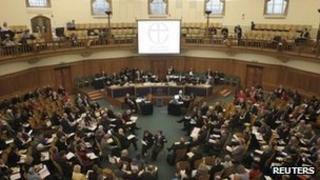 The General Synod defeated a bid to increase the autonomy of male bishops looking after traditionalist parishes. But the Synod did opt to back possible further amendments to legislation introducing women bishops in a bid to avoid a split over the issue. A final vote on the creation of female bishops will be held in the summer. Legislation as it stands would allow traditionalist parishes to have the right of access to an alternative male bishop - one who would intervene in the diocese of a woman bishop only at her discretion. The amendment aimed to define the alternative bishops' authority in such a way that it did not derive from that of the woman diocesan bishop. A number of speakers at the General Synod including Rt Rev Michael Perham, the Bishop of Gloucester, said they were opposed to such changes. He warned that the Church could face the prospect of campaigners in favour of women bishops unable to vote for final approval of the legislation in July if it were amended in the way proposed by the Manchester Diocesan Synod. "The worst possible outcome would be for the legislation to go down at final approval and that would be a disaster," he said. "I don't doubt that would mean a haemorrhaging of women from the Church's life and ministry." Some supporters of women bishops said the proposals would force women diocesan bishops to accept limitations on their authority. The Manchester Diocesan motion suggested "co-ordinate jurisdiction" as was proposed in an amendment moved by the Archbishops of Canterbury and York in 2010. It was passed then by the synod's Houses of Bishops and Laity but defeated in the House of Clergy. BBC religion correspondent Robert Pigott said traditionalist Anglo-Catholics on the synod wanted a guarantee incorporated into the law that they will have access to what they regard as fully "authentic" bishops. Many conservative Evangelicals also oppose women bishops because they believe the Bible requires male "headship" in the Church and in the family. The earliest the General Synod could give final approval to legislation on women bishops would be in July - it needs a two-thirds majority in all three houses of the General Synod.